I love to cook, why not post what's cooking in my world? The history and origin of Bloody Mary’s vary, I like to believe it was named after Queen Mary I of England. Queen Mary I of England was born February 18, 1516, the daughter of King Henry VIII and his first of six wives, Catherine of Aragon. Mary was the only child from that union to survive infancy. She reigned as Queen of England from July 19, 1553 until her death on November 17, 1558. Mary had always rejected and resented the break with Rome that her father had instituted and his subsequent establishment of the Anglican Church that had flowed from her half-brother's Protestantism, and now she tried to turn England back to Roman Catholicism. This effort was carried out by force, and hundreds of Protestant leaders were executed. The first was John Rogers (a.k.a. “Thomas Matthews”), the printer of the “Matthews-Tyndale Bible”. His execution was followed by the execution of former Archbishop of Canterbury, Thomas Cranmer, who was primarily responsible for the printing of the “Great Bible”. Hundreds more would follow in Mary’s bloody reign of terror. This earned the queen the title of “Bloody Mary”. Now that the history lesson is over, let’s get on to drinking! Bloody Mary’s are a popular drink to go with brunch. 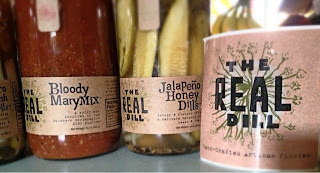 Recently Bob recently had the opportunity to review a line of artisan pickles from "THE REALDILL", they also sent a jar of their Bloody Mary mix. It is made from the brine of their Habanero Horseradish Dills, which are so de-lish! I have tested the mix a couple of times now, well three times if you count the one that is quenching my thirst. 2 dashes of celery bitters from "The Bitter Truth"
Whereas I like spice and heat, Bob not so much, but this mix has the perfect combination of spice and heat. It gives you the since of a very spicy drink but it leave you with just enough of the heat not to have to call the fire department out or eat a spoonful of sour cream. I would have to say that this has to be my favorite Bloody Mary mix that I have tried. Bloody Beer: Beer, usually a light beer or lager, replacing vodka. Often served with Worcestershire sauce, black pepper, hot sauce, and/or lime. Bloody Bishop : Sherry in equal measure to vodka. Bloody Cab: Cabernet Sauvignon replacing/in addition to the vodka. Bloody Derby : Bourbon replacing vodka. Bloody Fairy, Red Fairy : Absinthe replacing the vodka. Bloody Geisha, Bloody Ninja : Sake replacing vodka. Bloody Maria: Tequila replacing vodka. Bloody Maureen : Guinness replacing vodka. Bloody Molly : Irish whiskey replacing vodka. Bloody Pirate, Cubanito : Dark rum replacing vodka. The latter is commonly found on menus in Havana, Cuba. Bloody Scotsman : Scotch replacing vodka. Michelada Clementina (or simply "Chelada") : Mexican beer replacing vodka, usually flavored with a couple of dashes of Worcestershire sauce and Maggi and Tabasco sauce. Usually made with Clamato (tomato juice with clam juice added). Usually the proportion of beer equals the tomato juice. Red Hammer : Through the 1950s in the Northeastern U.S., while vodka was scarce, gin instead of vodka was known as a Bloody Mary; once vodka became readily available in those regions, the traditional vodka-based Bloody Mary was known as a Red Hammer for a time. Virgin Mary, Bloody Shame, Bloody Virgin, or Bloody Barbara : Without alcohol. Typically with an increased volume of tomato juice, the vodka simply being omitted with no substitute. "Bloody Shame" is commonly used in Australia. "Bloody Barbara" refers to Barbara Castle, the British Minister of Transport who introduced tougher drink-driving laws. Bohemian Banana Cake......ooops soory for the drool.. I was born and raised on the East side of Portland Oregon, by two native and second generation, Oregonians, my Mom and Dad (Jack and Joan). Oregon, and the Northwest are deep in my blood. That being said, I have always had an interest in cooking. I would love to add a warm loving story here about how my Mom nurtured my love of cooking by setting me up on or near the counter top to help with whatever she was cooking. Well, that's not exactly the case. Being a child of the 70's and 80's, I had a great exposure to classic foods like Spam, Tang, Rice-a-Roni and Hamburger Helper. While many of these premade, sodium roller coaster, treats where regulars on our table, my Mom would have to hold the title as "casserole queen". Casseroles are her favorite and her specialty. Whereas, my Dad was more of a spur of the moment kind of cook. His creations included many of the items from our makeshift pantry. Sometimes, i think he was thinking, "the more ingredients, the better it'll be!". I think my first attempt at cooking would have to have been making cookies, either peanut butter (with the criss-cross fork tine print on top), or chocolate chip cookies. Over the years I have made so many of both of these recipes, I have surely lost count. During middle school, my Mom encouraged me to take Home Economics, thinking that all kids, boy or girl, should know how to cook out in this world. This sparked a growing interest in cooking. So when I entered my junior year of High School, at David Douglas, I enrolled in the culinary arts program, we called it Food Services I. This was a class that had been offered many years before, where the students ran a restaurant, The Kilt, during the lunch periods. Unfortunately, since the class had not been offered in several years, so we didn’t have enough students to open the restaurant, that year. Within the first few weeks of this class, my instructor asked if I'd like to be involved in an outside "club" (kind of like a version of Eagle Scouts) that was mentored by local business owners. It sounded interesting so I joined (not to mention it got me out of the first 2 periods of the day). At our first meeting I was approached by Sylvia Poesdel, the owner of the Portland landmark restaurant, Sylvia's Italian Restaurant & Dinner Theatre. She asked me if I would be interested in an afterschool job, coming to work for her to learn the cooking/chef trade on the job. I jumped at the chance and started in October of 1985. During my senior year I rejoined the culinary arts program (Food Services II) and this year we were able to reopened the restaurant, which the rest of the students voted me to manage. I just absolutely loved it! I worked at Sylvia's until after I graduated, in 1989. I learned a lot about the restaurant industry, and I would have to say it would be one of just a few life altering jobs I have had throughout my career. After high school, while I was working at Sylvia's, I applied to culinary arts school. The Two things kept me from continuing my career in culinary arts, were financial and having worked out in the field, I saw so many negative attributes to being a chef, I decided that since I love to cook, I wanted it to be a hobby, and not a drag to go work each day. When I left Sylvia's, I worked at a hotel, then Safeway. From there I joined Fred Meyer in the Service Deli, and was quickly promoted to a manager. During the next 8 years, I worked throughout the Portland and Southern Oregon areas. In 1998, I earned a promotion to the regional specialist position (District Manager) in Seattle. During this career move, I learned so much about the Food Service industry. I was charged to develop a new service salad case program, as well as work on a new catering program. I had the opportunity to work with manufacturers to develop these new programs. In 2000, I met the love of my life, Craig. I also, moved from the food service program to the grocery department as an assistant manager. In the capacity I learned to develop my management skills as well as managing inventory. By being the best in my category, I earned the position of manager, where I moved from store to store cleaning up and reorganizing as I went. I also was entrusted with training future Food managers for the region. At which point I was pursued by another company to run a store for them, and enter back into the restaurant industry. During these 3 years, I learned the Restaurant Supplier side of the business. While I enjoyed the time I spent in this opportunity, I yearned to go back to the Grocery industry, and spend more time with my first love, cooking, and writing about my adventures….in the kitchen!